I recently experienced a situation where the Neuron ESB service would hang when restarting. ESBService.exe was stuck at Stopping and didn’t finish within 5 minutes, so it seemed to be permanently stuck. 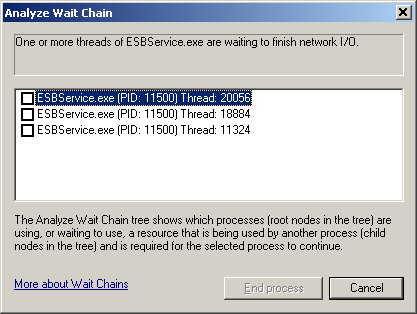 Resource Monitor’s “Analyze Wait Chain” feature showed that 3 threads were waiting to finish network I/O. The call stacks indicated that the problem was related to RabbitMQ. I decided to forcefully stop the ESBService.exe process. When starting ESBService.exe it was still trying to communicate with RabbitMQ and hanging. Event Info: An error occurred trying to update the status for RabbitMQ exchange "DEFAULT.Enterprise.FileContent": This request operation sent to net.tcp://localhost:50004/MasterControl/ did not receive a reply within the configured timeout (00:01:00). The time allotted to this operation may have been a portion of a longer timeout. This may be because the service is still processing the operation or because the service was unable to send a reply message. Please consider increasing the operation timeout (by casting the channel/proxy to IContextChannel and setting the OperationTimeout property) and ensure that the service is able to connect to the client.. Attempted to Query 'localhost' on port '15672'. I decided to restart the RabbitMQ service, which solved the problem. After this the Neuron ESBService.exe was able to start and work normally. If the problem occurs again, I will take and examine memory dumps of the RabbitMQ service, in an attempt to learn the cause of the problem. This occured with Neuron ESB version 3.5.3.411 and RabbitMQ version 3.2.2 (bundled with Neuron ESB). It seems relevant to update RabbitMQ, but compatibility with the current Neuron ESB version is currently unknown. System.TypeLoadException: Could not load type 'Neuron.Esb.Adapters.AdapterEncodingTypeConverter' from assembly 'Neuron.Esb.Adapters.FlatFileAdapter, Version=1.0.0.0, Culture=neutral, PublicKeyToken=null'. 2. Removing the old and unwanted DLL. Avoid storing multiple versions of custom adapters in Neuron ESB’s search path to avoid potential problems like this.